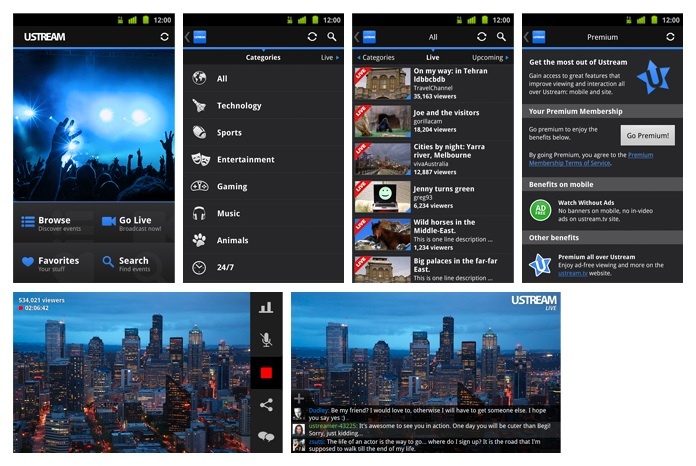 Ustream Android app hits 2.5 Million Downloads! 2.0 version released with Premium Membership, Ad-Free experience, Korean language support and a slick new interface! Hey, it’s Gergo from the Ustream Product team! I am pleased to announce that the Ustream Android app has now reached 2.5 million downloads plus version 2.0, and not without reason. Let me guide you through the top highlights. Immerse yourself in the Ustream experience with the new Android app, which now sports a slick, polished dark theme. It supports device rotation to landscape mode, intuitive swiping navigation, enhanced actionbar (screen header) functionality, and many more. Go live right on the spot using the new Quick Broadcast widget. You can easily place it on your Android home screen, and simply tap it whenever you see something interesting. 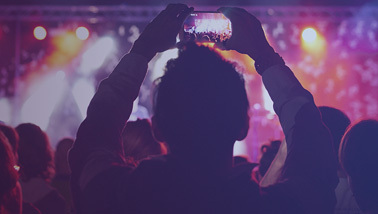 It will go live instantly, broadcasting to an unlimited audience using the camera of your device. Please sign in and select your channel before your first broadcast. The Ustream Android app has always been free to download for the community. To maintain its development, the app is supported by unobtrusive banner ads appearing at the bottom of some screens. Enjoy Ad-Free experience at any time by purchasing Premium Membership – either in the app using Google Wallet or on the Ustream website. Your Membership benefits will work on all your Android (and even iOS) devices, but you get even more at ustream.tv. In addition to English and Japanese, the Ustream Android app supports Korean language starting from version 2.0. We’d love to hear from you! Go ahead, drop us a note at community.ustream.tv. We’re working to give you the best personalized Ustream experience, anytime, anywhere. Stay tuned for more updates! 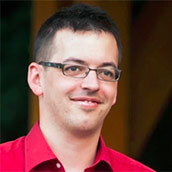 Gergo Radnoczi is responsible for the Android products at Ustream. He defines roadmaps and feature set, approves designs, specifications and implementations.